The cable tension on our arbor mounted reels is very easy to adjust, making these one of our most popular and versatile cable retractors. Arbor mounted reels use a conventional power spring. As the cable is extended, the cable tension increases. By holding the arbor and spinning the reel, the internal spring will start to engage. Once the spring has reached the desired tension, the cable can be wrapped back onto the spool for operation. This is called “prewinding” the spring. To decrease the tension, hold the reel from spinning and remove one wrap of cable from the spool. With the arbor held in place, allow the reel to spin backwards one full turn then wrap the cable back onto the spool. Arbor mounted reels are commonly used in aircraft interiors to facilitate the opening and closing of cabin doors, stairs, luggage compartments and tray tables. Our arbor mounted mechanical spring reels are designed to mount onto a square shaft. 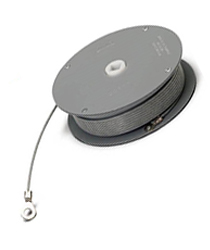 These spring reels have an exposed cable and spool which allows the end user to adjust the spring tension. The internal power spring is made of high carbon steel, the case is powder coated steel and the arbor is acetal (POM). Seven standard models are available ranging in diameter from 3-3/8” to 6”. These arbor mounted spring reels are slim and strong. Retraction forces are available from 2.0 lbs. to 35.0 lbs. - 7 standard models with pull forces ranging from 2.0 lbs. to 35.0 lbs. Select from our list of standard arbor mounted spring reels in this Selection Guide below where you can also find detailed information about our models. You can also use below chart for reference to find out exactly which of our Hunter Spring arbor mounted reels that suits your needs. Request more information to see how we can help you with an arbor mounted spring reel that suits your need.